How to organise and plan your family shoot! Family photographs at weddings in Melbourne, Australia are one important puzzle piece for your wedding. We want to ensure that you get wonderful family portraits at your wedding – we always get questions about how to organise this type of photography. We are sure other wedding photographers in Melbourne will have a similar experience. Some couples opt even out of posed family photos and just want a creative bride&groom shoot. Others just do it for their families – your parents, grandparents, aunties & uncles, … might want a memory of your wedding day. Of course there will be candid shots of them during the day but this might not be what they expect. It’s a difficult question and will depend on your individual wedding and timeline. A good time is usually right after the ceremony. Everyone is there and it’s easy to get the pictures done. Everyone after the ceremony will want to congratulate and you usually have a short time window to take these photographs. When your ceremony is fairly late or you have a big extended family you want to avoid that the family portraits happen at the valuable sunset time. This special time with the best light should be reserved for your bride & groom photoshoot. Light is the most important for good photographs and it’s the easiest to plan the family portraits in the daytime after the ceremony. It’s also possible to do the family portraits before the ceremony (only if you are happy to see each other before the wedding ceremony). It’s usually a bit more time and fairly relaxed when you do them in the morning with a glass of champagne. But as said every wedding is bit different. 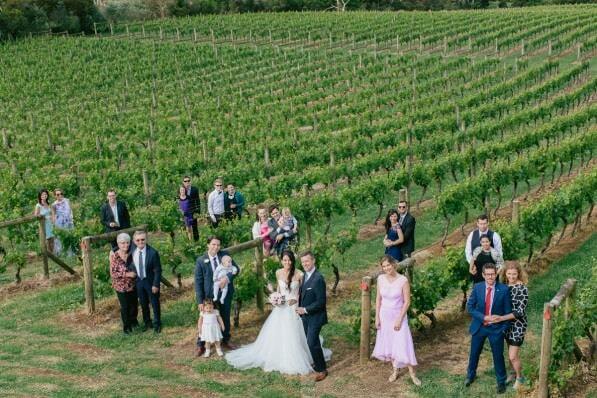 It’s easy to waste too much time to gather all the people for your wedding family portraits. There is always someone missing when you don’t plan it. Uncle John needs to check out the wine cellar, aunty Elisabeth is getting her make up done on the toilet, cousin Bob is charging is phone in the car and some cute babies might need a feed. Let everyone involved in the family Photoshoot know when and where it’s happening. You might not know exactly where to go so just agree on a meeting point. Prepare a possibility to sit down for older members of your family. When everyone knows that you want a family Photoshoot done after the ceremony and they are told not to disappear you have a better chance of getting it done quickly. The more instructions you give the smoother it will run. What family combinations do you want? It’s advisable to know exactly the family combinations you want to have a photograph of. Write down all the names. The more detailed the better. 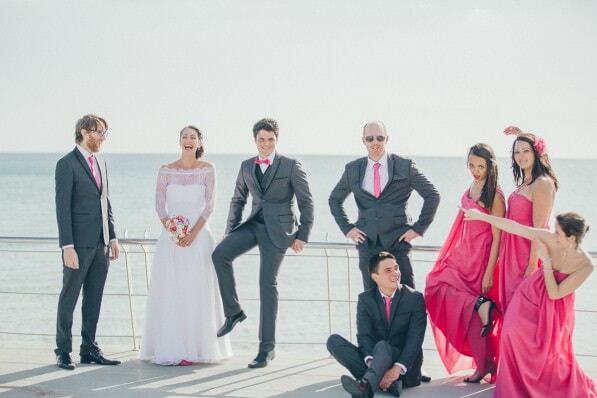 Not just brides family & grooms family – write down all the names. Start with the biggest group and then take one layer after the other off. It’s confusing when you swap people out, add or take out people and have no structure. The bride & groom are the main building block. Be careful creating a long list of combinations – formal shots are usually reserved for the immediate family and don’t forget that there will be plenty of candid shots. 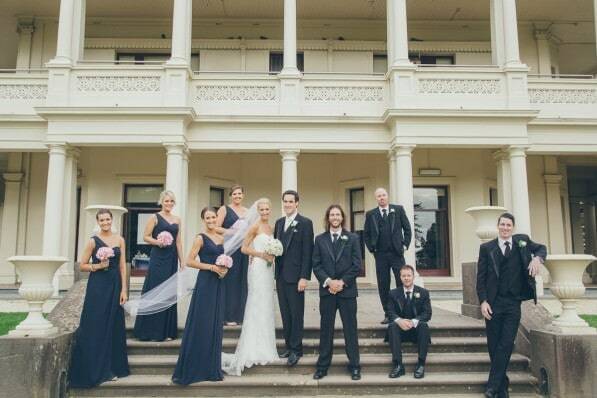 In Melbourne we often see big bridal parties with lots of bridesmaids & groomsmen. You might take them on your bride & groom wedding shoot or you also could include them in your family portraits – totally up to you. As they are not always immediate family we tend to see them more often in the first half of your bride & groom photoshoot. Such a combination list helps you to not forget an important combination. It’s advisable to write down the full names – this gives us the chance to help you with the combinations as a fall back solution. Please also send us the list before your wedding – as wedding photographers we are happy to help you finding the right order and help you with the timeline. Even when you told everyone to be ready for a family shoot and the family knows what to expect it is advisable to have a family representative on the brides and grooms side ( you can have only one when the assigned person knows both families). This could be your sister, brother or uncle who is known by everyone and knows everyone. They are there to help to gather the people and make sure no one runs away. Their job starts straight away after the wedding ceremony. Give them your list of your photo combinations and they can prepare the next combination while we are photographing. A quick changeover is guaranteed when they use their authority. A Melbourne wedding is fast paced and as wedding photographers we want to help you that your wedding runs as relaxed as possible. Having a well planned wedding timeline with some buffer time helps. We usually plan around 1.5 minutes for each combination – this might be a bit faster for smaller families. When you have 30 or more people in your family plan generously. The most time is lost when you can’t find a family member or other wedding guests start lining up for photos with the two of you ( yes … we saw this and it took over 1.5 hours – you decide what happens – it’s easy to take some shots with your guests at the reception. Don’t worry when you have planned too much time … It’s easy to sip a glass of champagne or just mingle and relax. At bigger weddings is near impossible to capture all guests. There is an easy solution: A photo booth at your wedding gives you the chance of having a fun and/or formal picture of everyone. Especially when you celebrate with lots of guests it’s a easy and simple way of ensuring everyone gets a photo. We sometimes set up a little photo corner for bigger weddings when you book two photographers. There are also companies which specialise on fully automated photo booth ( like a passport photo machine) in and around Melbourne – plenty of options. We hope these little tips help you to create a relaxed wedding in Melbourne, Australia and create wedding memories for a lifetime.